I have been fortunate to have been included in a great many FaffCons and FaffCamps. 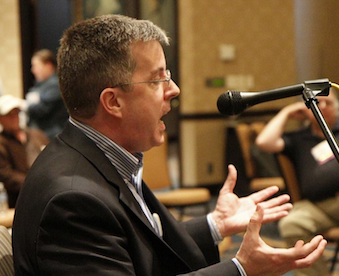 These are unconferences and conferences for voice-over talent and they are among the most revered voice-over events by anyone who has ever attended one. Full disclosure, I am on the FaffCamp and FaffCon committees because I believe so strongly in them. Also because I am so small, conference producer Amy Snively hardly notices I’m there. At this FaffCamp, I offered a marketing planning presentation on Saturday and Sunday. 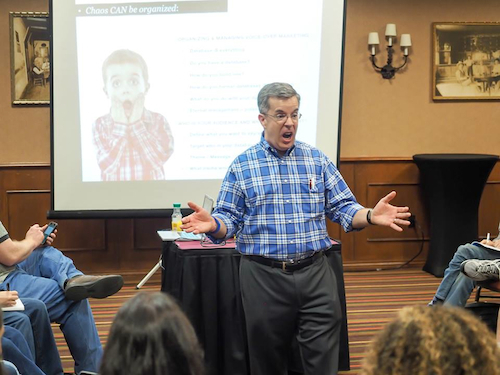 Though the presentation was meant to be informative and somewhat light-hearted, I noticed a couple of things in both groups that I believe are universal among voice-over business owners. Maybe you’ll see yourself in some of this. I certainly see myself in some of it. 1. Most voice-over business owners generally don’t like the business part of the voice-over business. In no way am I saying they don’t do it well but they don’t like it much. I think they like it less than most business owners. 2. Though they themselves are a key part of the marketing food chain with the service they provide, voice-over talents do not like doing marketing much. It overwhelms them and intimidates them for the same reason I think it intimidates most small business owners: “where do I start? !” syndrome. 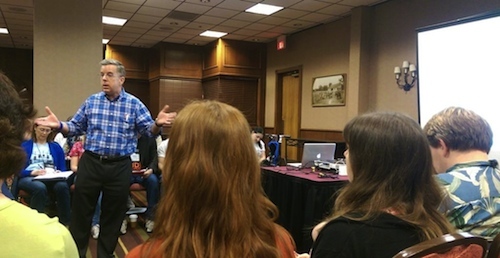 I post this not so much for the FaffCampers who attended my presentations (and thank you for doing that) but for other voice talents who couldn’t make it to San Antonio. I want you to be reminded that you are not alone in your business challenges and that rather than have it be a mountain, operational and marketing challenges can be only a bump in the road to your ultimate business success. Just remember to believe in yourself and your abilitiesâ€¦even those abilities you don’t think you have. FaffCamp is coming to San Antonio, Texas March 19-22 this year. If you’re already attending, I look forward to seeing you there as I will be there as an attendee and a presenter. If you work in voice-over, you are invited to attend…like right here, now, this is your invitation. That knocking sound you hear is opportunity. 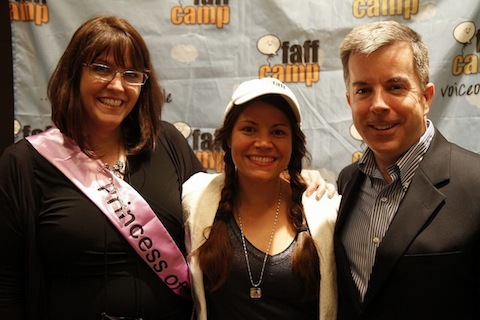 For those uninitiated, FaffCamp is a peer-to-peer professional development conference for working voiceover pros (not just voice talents, voice actors, and narrators, but all pros who do work related to voice overs). It’s participant driven and highly interactive, just like its sister event FaffCon. But at FaffCamp much of the agenda is set in advance, which makes it possible for Faff Camp to welcome a larger group. Plus, there are cool things we do only at Faff Camp, like Topic Tables, Adopt-a-Question, and Lightning Talks! And since we have two tracks, Starting Smart and Working Pro, we welcome voice talents at ALL career stages. 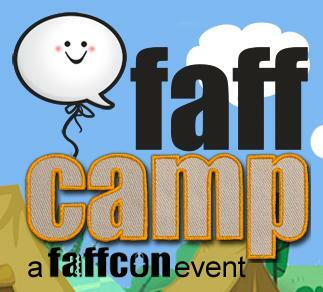 I don’t have an ownership stake in FaffCamp or FaffCon but I am on the organizing committee and have been for many years, because I believe in it. 2. FaffCamp is like Voice-Over College. FaffCamp brings together a whole lot professionally and financially successful voice-over talents. Many of these folks are past Faffers who have both learned a lot and shared a lot at Faff events. Bottom line: walking and talking between sessions, at meals and in other social times is basically like going to Voice-Over College. If you have questions â€“ the answers are likely at FaffCamp. 3. You’re surrounded by people who understand you. Either you are today or want to be someone who sits in a booth all day and talks to him/herself. You’re not normal and neither are FaffCamp attendees, cause we do the same thing. We understand the professional and personal challenges of being a performer, a small business owner and bread winner. You got questions? Very likely we’ve got experienced answers and the meter is NOT running. One last piece of advice: Go. I missed the very first FaffCon. My magnificent third child was coming into the world and Mrs. audio’connell somehow felt it was more important that I not spend a weekend in Portland, OR lest my dear boy make an early entrance while I was three time zones away. My suggestion that she just hold her legs together during the trip was not accepted with grace. Need I reiterate, it was only a suggestion?! Oh, that was also the time I found out I’m a bleeder. So I remember that whole weekend thinking ‘I wonder what they’re doing now at FaffCon? I wonder who’s speaking? I wonder what they’re talking about?’ I was bummed even though I didn’t yet have (or fully understand) the FaffCon experience. I made a promise to myself I would make it to the next FaffCon. After attending FaffCon 2 in Atlanta, I promised (save for something of immense importance) I would not miss another Faff-event. As I sit here going through notes and business cards and memories, I am thinking of some of the posts of those who couldn’t goâ€¦who wanted to go but for all the right reasons (whatever they were) didn’t go. And as I began to type of my profound joy from everything and everyone at the FaffCamp event, I stopped. I really did. I am profoundly grateful not only to everyone I spent time with, learned from and especially worked with on FaffCampâ€¦but those feelings and opinions extend to each and everyone of the past FaffCon attendees as well. I wanted EACH of them to be at FaffCamp for their own professional and personal development but also for my own selfish reasons of wanting to be around and learn from greatness. Yet, remembering my feelings about missing the 1st FaffCon, I don’t want to boast about the many things I took away from the event lest it make my fellow Faffers who attended in spirit feel badly, feel jealous or feel sad. That is NOT the spirit of FaffCon. Each of you in abstentia need to know, as a matter of record, you were missed. That is not stuff and nonsenseâ€¦I speak sincerely and from the heart. Though nor do I (by way of this post) want to take away the euphoria of the other FaffCampians who ARE posting their joy and pictures and thanksâ€¦.they can and they should because it’s all for the right reasons. They want to share their joy and I am enjoying it. There are over 100 people to thank and I tried to tell them all yesterday (especially the sponsors). If we spoke, if I shook your hand, if you watched me present —if you shared any of your time with me at the event, thank you. I thank our foundress Amy, my brother from another mother Dan, the ever- supportive and lead improviser Natalie and our dearest angel Lauren for leading this event to its very successful liftoff, execution and completion. “Tireless dedication” is an over used phrase in most descriptionsâ€¦except this one. And so I’ll end it there. If I name anyone else, I’ll stupidly forget someone unforgettable. Call me if you want to hear my FaffCamp experience one-on oneâ€¦I’ll gladly share my phenomenal experience. Because, really, for those of you who understand a Faff-event, no description is really necessary and for those who haven’t, no description will suffice. I hopeâ€¦I mean really hope, I see you all in San Antonio. Thanks for being my friends.